Kids of any age will love delving into science with this collection of experiments for year round science fun at home or in the classroom! 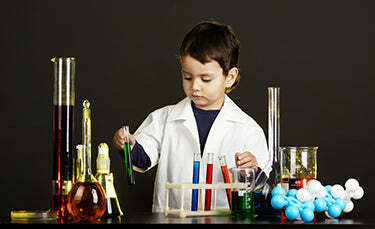 Tapping into a love of science at an early age is great way to foster an ongoing interest in the subject and to give kids an early introduction to a key STEM element. Whether you’re partaking with a preschooler or boosting some enthusiasm on the subject with a preteen, hands-on science experiments are sure to be a crowd pleaser at home or in the classroom. We hit the Pinterest boards and gathered up these 14 links to experiments that will ignite that spark and have the kids begging for more! Walking with Water from Coffee Cups and Crayons takes minimal setup and provides a great visual for explaining color blending and capillary action. This is an easy step-by-step with a nice section on troubleshooting if needed. Exploding Pop Rockets from Playdough to Plato add some excitement to the mix. Upcycling candy containers and adding some pizzazz makes for a fun art and science mix. May the force be with you as you try this collection from Science Sparks. From balloon-powered cars and hovercrafts to popping coins, the kids will love learning all about different forces with these investigations. These Edible Experiments from Fantastic Fun and Learning are sure to get kids involved! From raisins to rock candy and ice cream, there’s sure to be an experiment to please every palate. Magnetic Slime from Frugal Fun for Boys will really attract kids to the fun of science. There are lots of cool ways to manipulate the slime and some great tips for working with the materials. This Fall Collection from Lemon Lime Adventures has a great variety for home and school. The experiment on Why Leaves Change Color is really amazing! Happy Halloween from Creekside Learning! Make pumpkins explode, worms dance, and dabble into brain surgery with this collection. Each experiment gives the science behind it and makes for creepy crawly fun! Dancing Candy Canes from Inspiration Laboratories will have these sweet treats busting a move! Check out the extension suggestions for incorporating other holiday objects to see which ones make the best dancers! All part of a larger advent collection for the holidays. These Winter Experiments from Creekside Learning will have you exploring the elements indoors and outdoors. From creating frost in a can to uncovering the science behind salt trucks, this is a great collection for all ages. Let this Conversation Heart Experiment from Coffee Cups and Crayons spark some predictions and conversations at home or in the classroom. Any collections of liquids for dissolving will do, and kids can observe and record the different outcomes. These 3 Egg-citing Experiments from Playdough to Plato can be completed over the course of several days. Just a few eggs and different liquids can bring about big conversations about osmosis! Head to the garden for some Spring Science activities from Fantastic Fun and Learning. From dissecting seeds to growing a garden in a glove, kids will enjoy learning about buds and blossoms as spring arrives. Pack a Patriotic Punch with this Fireworks Experiment shared by MPM School Supplies. Kids will be amazed by the fireworks in a jar, and discussions about density and solubility can easily flow! With these Summer Experiments from Growing a Jeweled Rose, the opportunity to get outdoors and get a little messy will be real crowd pleasers. Exploding chalk rockets, bubbles, and squirt guns are just a few of the stars in this fun collection. Looking for a way to impact older kids with these introductory experiments? Try hosting a Science Day and inviting a younger grade level to watch the older scientists present an experiment and explain the science behind it. Sharing a simple experiment with older kids and having them devise a second experiment that explores/shows the same concept would also be a great higher level activity. With a collection of attention grabbers at your disposal, igniting or re-lighting that science spark is sure to happen! Backpack Bonus: Ideas to tuck away for another day. Back-to-school season making pizza delivery a regular in the weekly dinner rotation? Check out these pizza box transformation ideas from Teach Preschool.